For budgets under $100 to pro-level electric options. If it pasta be perfect; it hasta be home-made. Have you recently opened your kitchen cupboards to find masses of dried pasta that you bought from the grocery store? A recent survey found that 23 percent of Americans eat Italian food at least three to four times a week. And what’s more Italian than pasta? Packaged dry pasta can be a great time saver, but there’s nothing more satisfying than making it from scratch. When you enjoy delicious pasta at your local Italian restaurant, you can be assured that it does not come from a box! Whether it’s meatballs and spaghetti, a deep filled lasagna or delicate ravioli parcels, freshly made pasta always tastes better. You know exactly what’s gone into the pasta, with no unhealthy preservatives. Owning a pasta maker will make it so much easier to produce fresh quality pasta in your own kitchen. Join us as we look at some of the best pasta makers currently available. We also show you what to look for when choosing a new pasta maker. What Exactly is a Pasta Maker? Many pasta makers are actually pasta shapers. Unless you invest in an expensive automated electric model, you are still going to have to make the dough for the pasta yourself. A pasta maker is simply going to turn that dough into different pasta shapes. The classic design of a pasta maker hasn’t changed dramatically over the years and is still found in many Italian kitchens. Normally, a crankshaft is used by hand to turn rollers, which, in turn, roll the pasta to your desired thickness. A regulating knob on the side of the machine will allow you to choose the thickness, which varies for each type of pasta. You could just use the sheet of pasta whole once it’s rolled, as in lasagna sheets, or you can cut it to shapes. Most quality pasta machines will come with built-in cutters or attachments for cutting long shapes like linguini, fettuccini or taglioni. You can often buy additional attachments for making other types of pasta like spaghetti, capellini and even filled ravioli. Our top pick is the VonShef 3 in 1. Yes, it IS a manual pasta maker meaning you'll have to use up a few calories making your food. But imagine the warm glow of knowing you REALLY made that pasta by hand, and you can soothe your aching arm muscles with the knowledge that you had the authentic Italian experience! This is consistently rated as a good general use pasta maker – not necessarily professional quality, but, if you're just making the occasional pasta dish for friends and family, you don't really need pro-kitchen standard equipment. And you certainly don’t need the professional standard price tag! The VonShef comes in a cool, retro design, which very much captures the zeitgeist, not just of homemade and handcrafted, but of a more general harking back to bygone eras. It is stainless steel, making it relatively easy to clean, and rust resistant – an important point when you're using it to make food! One of the drawbacks to this model is that it can be difficult to clamp in place – the clamp ISN'T adjustable, and seems to have been designed for a set thickness of counter top – however, this is easily overcome by clamping the pasta maker to the edge of a chopping board, which is then placed on the unit. With the cool, easy-care, retro design, you'll be impressing your friends well before you've served them your home cooked pasta! 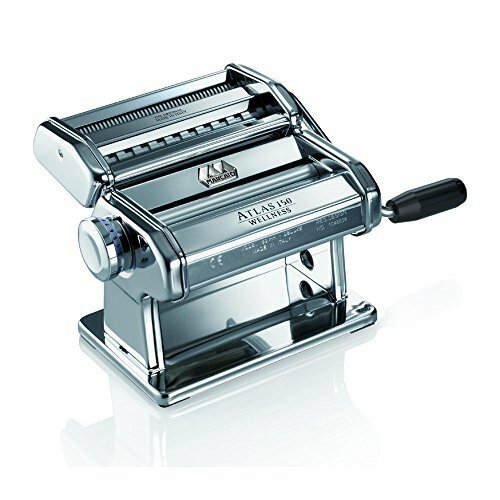 Starting at under $100, and going up in price depending on the color you pick, is the Marcato Atlas 150 which is deliberately designed not to leave any metallic residue on your pasta. It grips most kinds of counter tops well, meaning the machine is stable whilst in use, and provides a reassuring sturdiness. 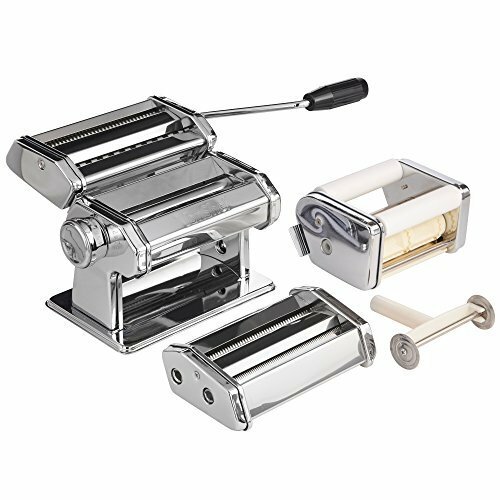 Its chrome and nickel plating makes it rust resistant, and easy to clean – as has been pointed out in reviews, if you've got the consistency of your pasta dough right, there shouldn't be a lot of messy residue on the machine in any case. Described as a “kitchen must have”, the Marcato Atlas consistently achieves 5* reviews, and its range of colors will blend perfectly with any kitchen, meaning that stylish practicality can easily be yours. However, if you simply must have an automated pasta maker – perhaps you have joint issues which mean that it would not be practical for you to use a manual machine, or you're working to a tight time schedule for an important family meal - the CucinaPro 160 Imperia can be considered a long-term, professional investment. Made in Italy, and thus providing that edge of European style, and an authentic feel – where better, after all, to have a pasta maker built than the home of pasta? - the CucinaPro offers a non-stick coating, meaning your pasta will be safe, clean, and successful every time you use the machine, without you having to worry about getting the consistency of the dough “just so.” It is also fully metal in construction, meaning it looks good, as well as performing well. The CucinaPro offers the opportunity of a variety of attachments, meaning almost no type of pasta is beyond your reach – a definite improvement on the 2-3 types of pasta usually offered by the manual models, and well worth the investment if pasta dishes are a regular guest at your table. Consistently rated better than comparable, cheaper models, the CucinaPro is definitely a worthwhile investment for the high-quality amateur cook who anticipates producing a lot of pasta dishes, and is therefore looking for the convenience and speed of an electric model of pasta maker. Finally, we have a good, cheap manual pasta maker which is ideal for a young person, or someone just starting out with home cooking. The OxGord manual pasta maker is listed at an affordable price, and is stainless steel, dishwasher safe, and comes with detachable blades for easy cleaning. It is intuitive and easy to use, although you might have some difficulty in attaching it to the counter top – however, this difficulty has also been observed in more expensive machines, so it is less a product of “you get what you pay for”, and more a consistent, albeit minor, let down in this type of kitchen accessory. The easy-click dial on the OxGord makes adjusting for your preferred thickness of pasta or noodles a breeze, meaning you can have your pasta the way you like it at the flick of a switch. Cooks who want the true Italian experience of creating fresh pasta tend to prefer manual pasta makers. A manual machine will give you more control over the finished product and allow for more varieties of pasta. You don’t have to use the attached cutters; you can cut by hand or use specialized pasta stamps. It can be very rewarding and, dare I say it, even fun to make your own pasta with a manual machine. Although you need to make your dough separately, this could be beneficial if you have a special diet, like gluten-free. You can also add ingredients, like herbs, spinach, beetroot or squid ink, for both color and flavor. Using a manual machine can be hard work though, with all that folding and rolling of the dough. Using one hand to feed the pasta, cranking the handle with the other and still catching the pasta takes practice. Even finding a countertop which fits the the clamp of the machine can be hard in some domestic kitchens. We have looked at automatic electric pasta makers in another article, but they tend to be more expensive and have more complicated components. By comparison, the best manual pasta makers are cheaper and will generally last much longer. When you decide to go down the old school route of pasta making, there are a few things you need to consider. Before rushing out to purchase a pasta maker, carefully consider the following factors. The price of pasta makers can vary significantly. Manual pasta makers will normally start around the $15 mark, but can often cost over $100. The brand you choose can have an impact on the price, with most Italian brands costing more. Until you decide whether pasta making is for you, a cheaper model can be a good place to start. The last thing you need in the back of kitchen cupboards is another expensive appliance you never use. Despite their low prices, some budget models can actually create quality pasta for a few years. 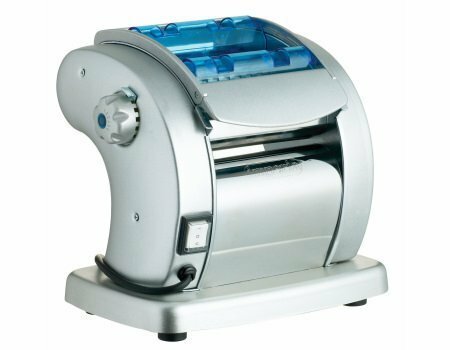 Take into account the cost of any attachments you may need too, as this can push up the price of your pasta maker. Attachments will allow you to produce a wider variety of pasta and noodle shapes. People who suffer from arthritis or other mobility issues will benefit from a strong motor attachment. Manual machines are more durable than their electric counterparts—there’s less to go wrong. If used correctly and properly maintained and cleaned, many of the high-end machines will last for decades. 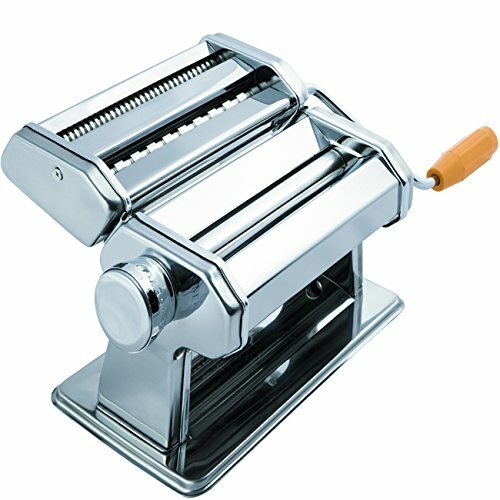 For the most durable machines, look for pasta makers with an all-metal construction and stainless steel parts. The length of warranty may also provide some clues to the longevity of a pasta maker. High-end models often feature two or three-year warranties, with brand leader Marcato offering an impressive 10-year warranty. If any of the parts should malfunction in those 10 years, they will simply repair or replace the machine. Something which directly affects the durability of your pasta maker will be the cleaning of it. Many machines can be disassembled for cleaning, but nearly all should never be cleaned with water. A dry brush or wooden rod is normally enough to remove flour or pieces of dough from the rollers. If too much dough is getting stuck, maybe your pasta mix is too wet. Leave it to dry before cleaning, and try less liquid next time. Most manual pasta makers will come with at least two cutters. They may include a double-sided cutter, that enables you to create spaghetti and linguine/fettuccine. If you want to make other kinds of pasta, like ravioli or capellini, check which attachments are available. The levels of thickness your machine offers will also determine which pastas you can produce. Angel hair pasta will require the thinnest of settings, sometimes only found on higher end pasta makers. Pasta makers which can handle thicker settings will be more versatile and can perform other tasks, like rolling cake fondant. Finally, cranking a handle on your pasta maker can make the machine liable to move around when used. Ensure your pasta maker comes with a secure clamp attachment or, at the very least, is pre-drilled for a clamp. Rubber pads or feet on the base of a pasta maker can also prevent it from slipping around the countertop. In short, if you're simply looking for a good, reliable manual pasta maker to get you started on your home cooking journey, there is no real fault to be found with either the OxGord or the VonShef – the latter may prove to be the go-to for those who already enjoy retro design in their home, and like their kitchen appliances to match, whilst still offering contemporary, labor-saving functionality. Whatever machine you end up purchasing, whether you spend $20 or $400, reports and reviews consistently agree – you'll never regret starting to make your own pasta! Many people have commented that they “never realized what (they were) missing” until they bought their first pasta maker! So – buy now, and become the envy of your friends with your home-made pasta from this range of stylish, affordable, easy-to-use machines. Whether you want an affordable machine for a cautious start as you dip a toe into the waters of home cooking, or a money-no-object professional experience, there's a pasta maker out there for you. Buying a pasta maker isn't just another fad, like the sandwich toasters of the 1970s, many of which still languish in cupboards, unused and unremarked, to this day – a pasta maker is an investment in a sustainable future, as it enables you to combat food waste without any onerous recycling or composting. Once you've invested in a pasta maker, you're able to make just the amount of pasta you need – meaning you can do your bit for the environment even from the confines of the smallest apartment in the most environmentally-unfriendly neighborhood. With a pasta maker, you also know exactly what's going in to your food, making it effortless to take allergies and intolerances into account, as well as easily engage with healthy, sensible food options. The 21st century is proving to be the century where people want technology and labor-saving devices to not just make their lives easier, but make them noticeably better – healthier, cleaner, and more sustainable. Pasta makers are an easy, enjoyable, affordable way to achieve those goals. So – savor fine, fresh, home made food whilst helping the environment, and buy a pasta maker today. All of the pasta makers we've mentioned here come with the attachments needed to get you started with pasta making, and you can always buy additional attachments, for different kinds of pasta, once you've found your feet. Other than that, a pasta drying rack is useful, for keeping your fresh, home made pasta nicely separated, and off the counter top, and, if you're a complete beginner, a recipe book discussing various styles of pasta dough might be helpful – these things are all easy to find online, and affordable. So, why not treat yourself to everything you'll need – your preferred pasta maker, a good recipe book, and a smart yet simple pasta drying rack, and begin the process of falling in love with a new, nutritious, sustainable hobby?